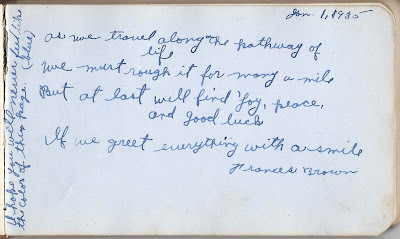 Autograph album of Elizabeth Sarah (Brown) Dole of North Haven, Maine, kept from the time before her marriage, with later entries from her children and grandchildren. Elizabeth's nickname was Lizzie. 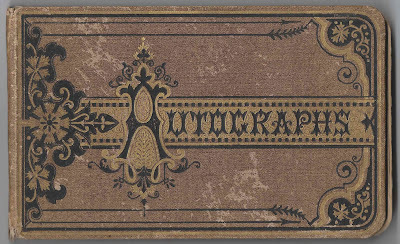 The first entry in the album was penned by Lizzie's cousin Clara, at North Haven, Maine, on 25 December 1877. The album may have been a present for that Christmas. 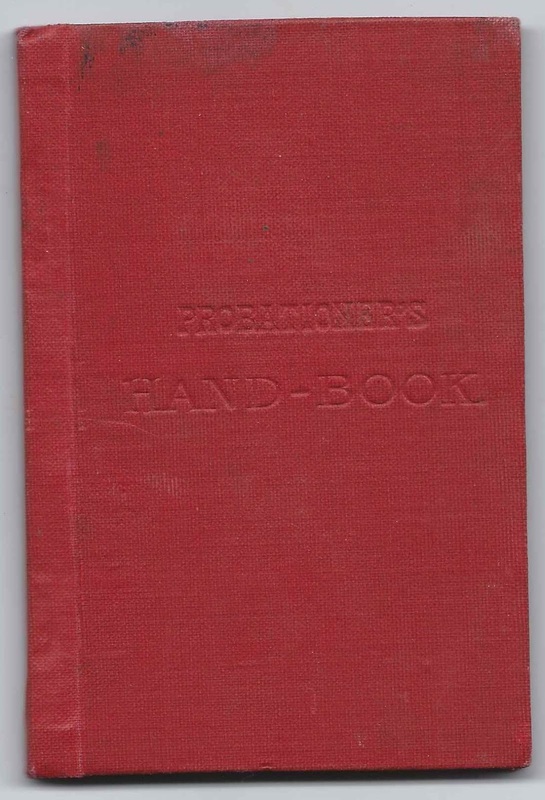 Actually, there was an earlier entry, scrawled upside down on the inside front cover, by Evelyn Brown, with the number 7 after her name, perhaps indicating her age at the time. 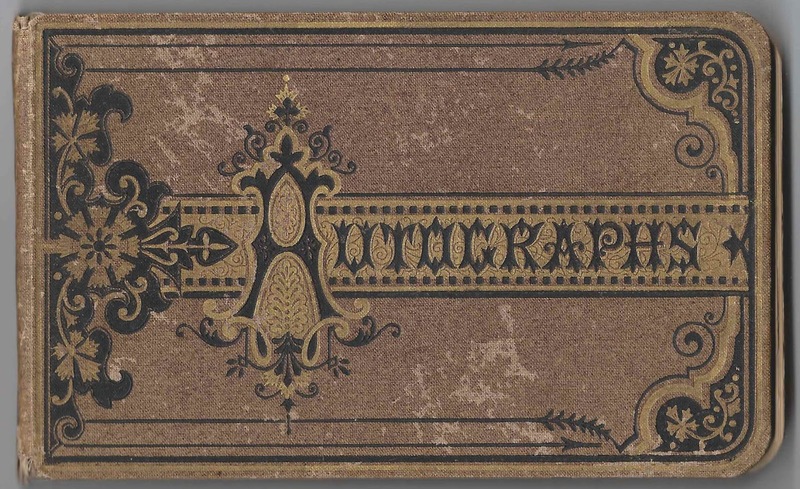 The album is approximately 7" x 4-1/4" and contains 40 pages signed by Lizzie's relatives and friends. An alphabetical list of the signers, including the sentiments they left for Lizzie, appears at the end of this post. Elizabeth Sarah Brown was born 11 July 1857 on North Haven island, the daughter of Wilder P. Brown and Abigail P. (Murch) Brown. 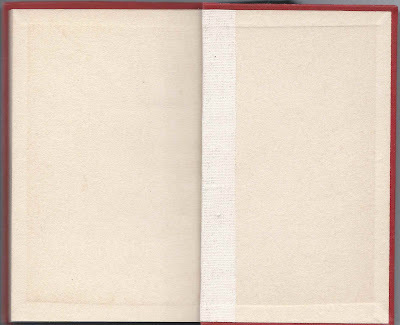 Each of them signed pages in Lizzie's album. Lizzie had a sister, Leonora, who also signed a page, as Nora F. Dole at 13 January 1878 at North Haven, Maine. 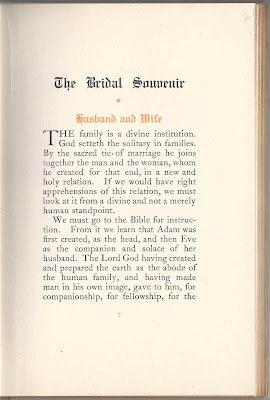 Lizzie and Nora married brothers, William Rand Dole and Asa S. Dole, respectively. 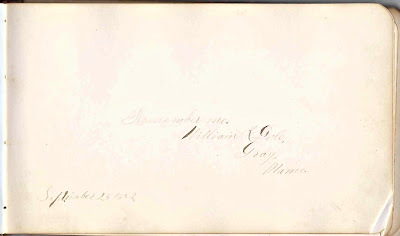 Lizzie's future husband William Rand Dole of Gray, Maine, signed a page on 25 September 1882. They would be married in 1888. 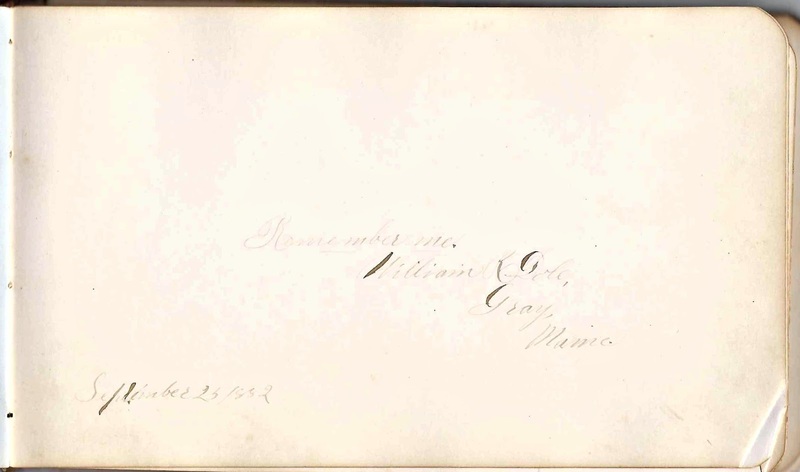 Nora's husband Asa S. Dole signed his page on 3 March 1878. William Rand Dole and Elizabeth Sarah (Brown) Dole farmed on North Haven island and raised, I think, two children, both daughters. There was a son mentioned in one reference but I couldn't find a definitive record. There was a tradition of taking in orphaned children as fishermen led, and still lead, a dangerous life. 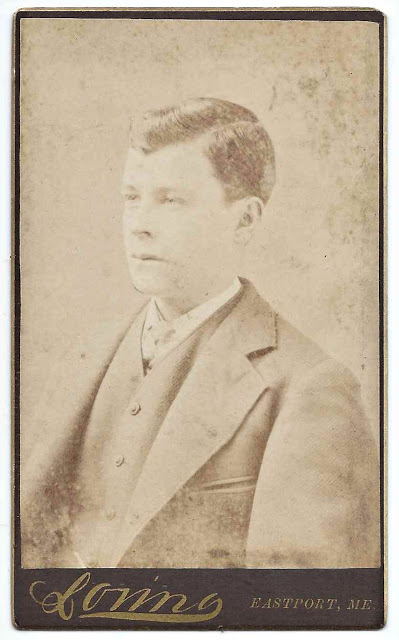 In fact, William and Lizzie's son-in-law, Corydon Staples Brown, husband of Florence A. (Dole) Brown, was the son of orphaned Mary Ella Clemmons, who was taken in by the Brown family. I believe she died 1 December 1936. William was still alive at the time of the 1940 Census; he died in 1946. See the list below for the names of other children, grandchildren, relatives and friends. If you can provide additional information on any of the signers, or if you have corrections to information provided on the Brown and Dole families, please leave a comment or contact me directly. Thanks! 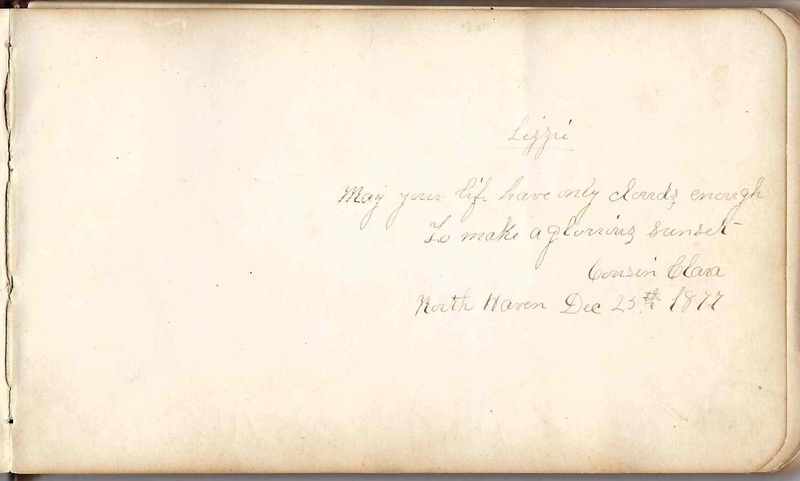 Cousin Clara, signed at North Haven, Maine, on Dec. 25th 1877; May your life have only clouds enough To make a glowing sunset. 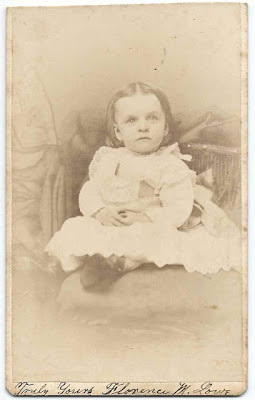 Cousin Clara"
Marietta Banks, signed at North Haven, Maine, on Jan. 15, 1878. 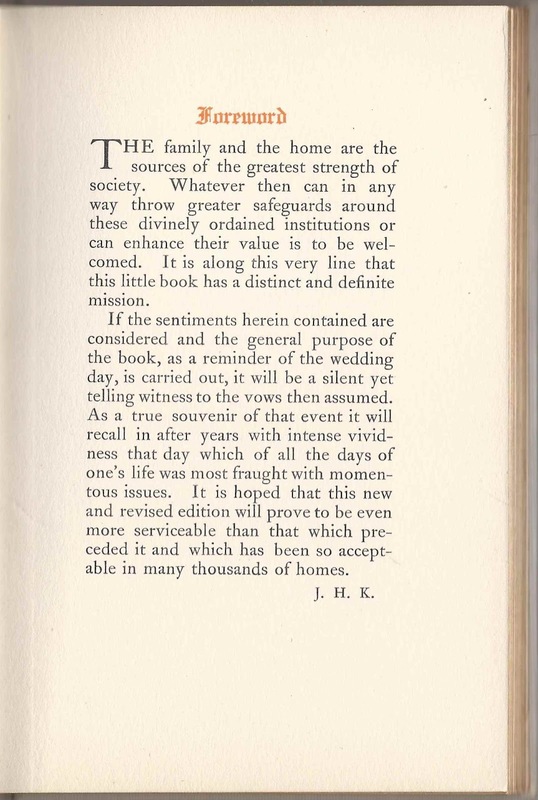 "The earnestness of life Is the only passport to the satisfaction of life. Your friend"
Etta J. Banks, signed at North Haven, Maine, on Nov. 8, 1885. "When far away by love you're carried And to some little fellow married, Remember me for friendship sake, And send me a piece of wedding cake. 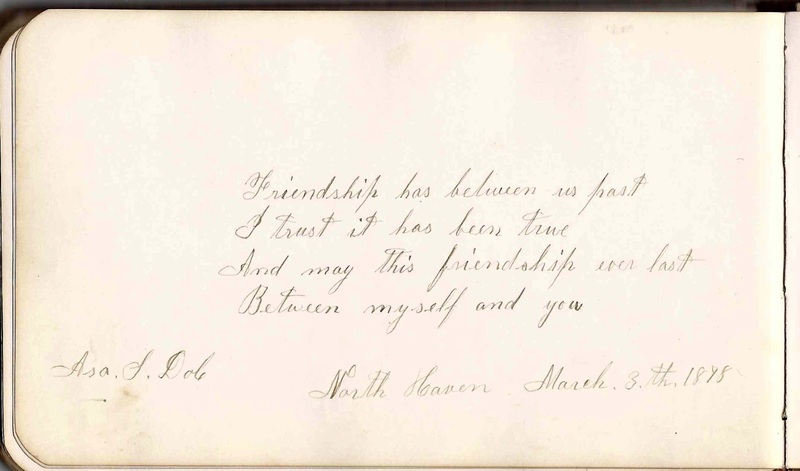 Your friend"
Elroy V. Banks, signed at North Haven, Maine, on Jan. 16, 1878. "The memory of my friend shall be As changeless as the Cedar tree." 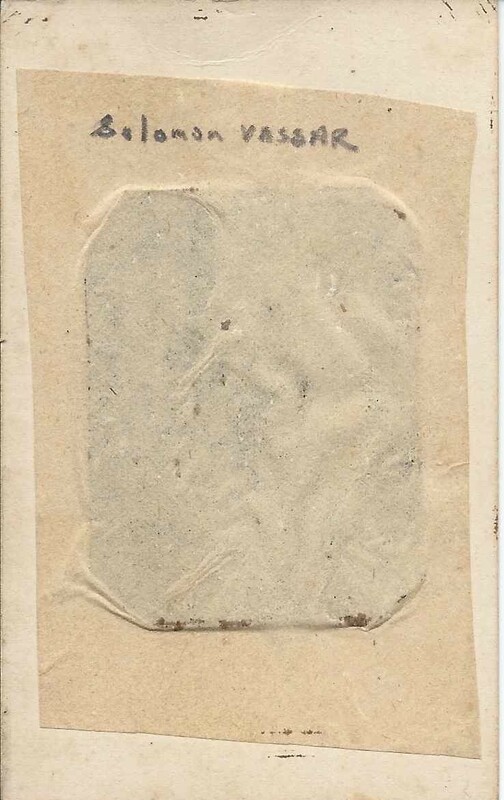 Jennie Banks, signed at North Haven, Maine, on Sept. 17th, 1884. "True friendship like the rose Although among the thorns it grows. Your friend"
Mrs. Theodore Beverage, signed March 6, 1935. "Dear Gram, Everyone else has written a line so I am just going to sign." 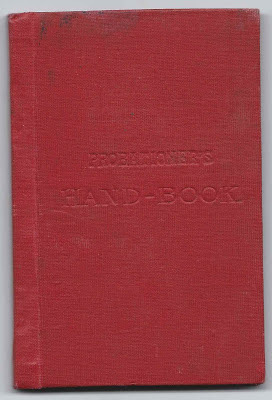 Frances Brown, signed on 1 January 1935. Elizabeth's granddaughter, daughter of Florence A. (Dole) and Corydon Staples Brown. "I hope you will never feel like the color of this page (blue). As we travel long the pathway of life, We must rough it for many a mile. But at last we'll find joy, peace and good luck If we greet everything with a smile." Blanche A. 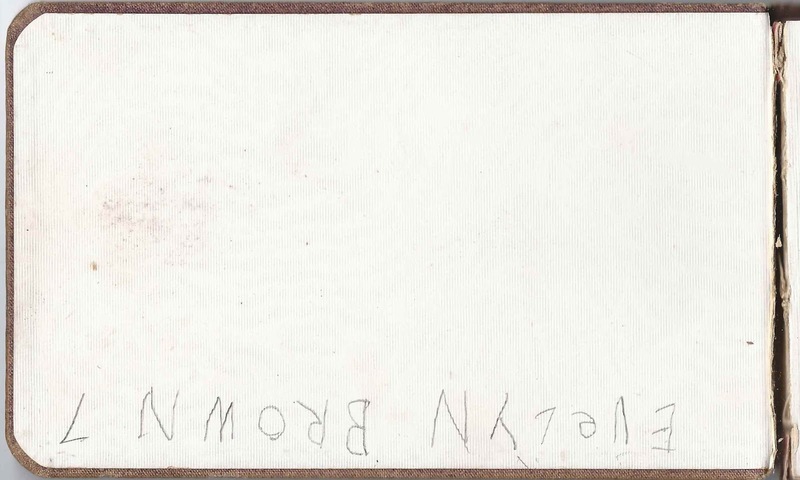 Brown, signed at North Haven, Maine, on July 18th 1880. 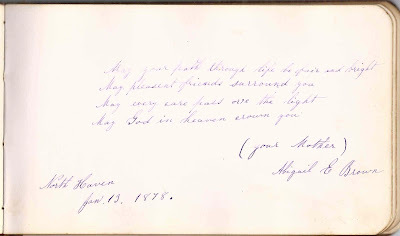 "May angels twine for thee A wreath of immortality"
Alice Elizabeth Brown, signed at North Haven, Maine, on January 3, 1935. Elizabeth's granddaughter, daughter of Florence A. (Dole) and Corydon Staples Brown. 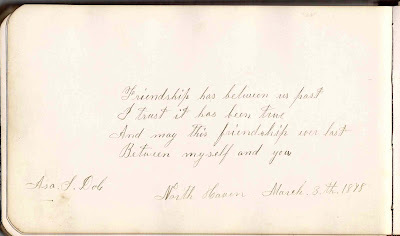 "Always your friend"
Wilder P. Brown, signed at North Haven, Maine, on March 3thm 1878. Elizabeth's father. "All that I ask is a little spot on which to write forget me not." 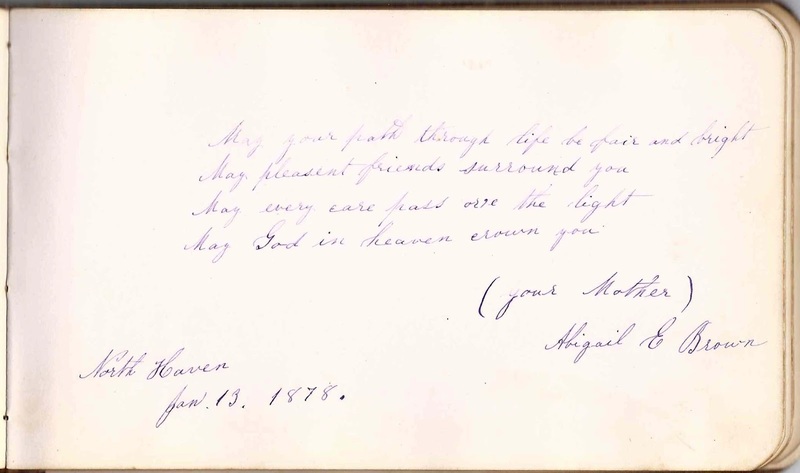 Abigail E. Brown, signed at North Haven, Maine, on January 13, 1878. Elizabeth's mother, Abigail E. (Murch) Dole. "May your path through life be fair and bright, May pleasant friends surround you, May every care pass ? the light, May God in Heaven crown you. 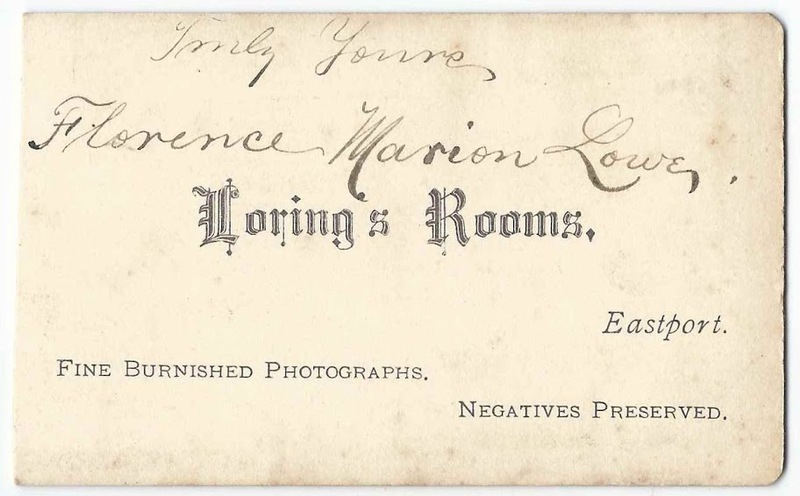 Your Mother"
"Idie E. Brown, signed at North Haven, Maine, on July 18th, 1880. ""Remember me. One little word of kindness spoken, A motion or a tear; Has often healed a heart that is broken, And made a friend sincere. 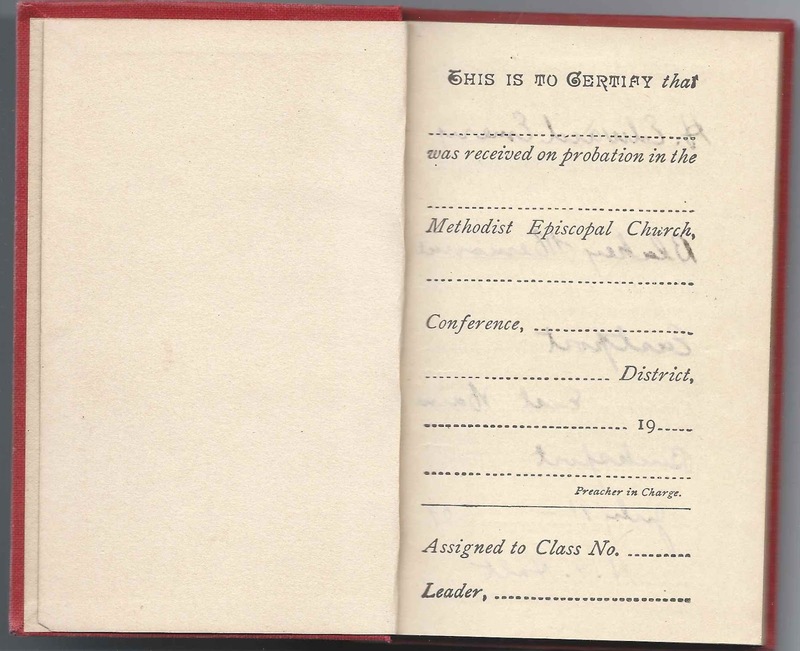 May Calderwood, signed at Pulpit Harbor, Maine, on Oct. 29th 1885. May all the blessings life can give Be yours, my friend, while here you live, And may you always find a friend True as the one these lines have penned. Always your friend." Is the wish of your Sister.""" Florence Dole, signed at North Haven, Maine, in Nov 1901. This was Elizabeth's daughter Florence. 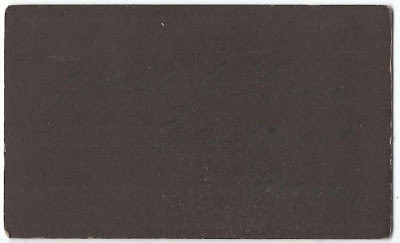 William R. Dole of Gray, Maine, signed on September 25, 1882. William Rand Dole would become Elizabeth Sarah Brown's husband on 22 December 1888 at North Haven, Maine. 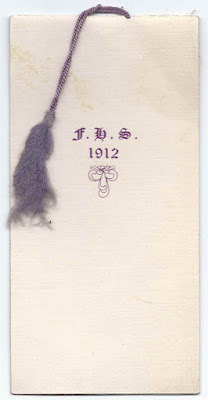 "Remember me"
Your daughter, Florence, signed Dec 1903 the 28. "He prayeth best who loveth best all things both great and small for the dear God made and loveth all. Your daughter." 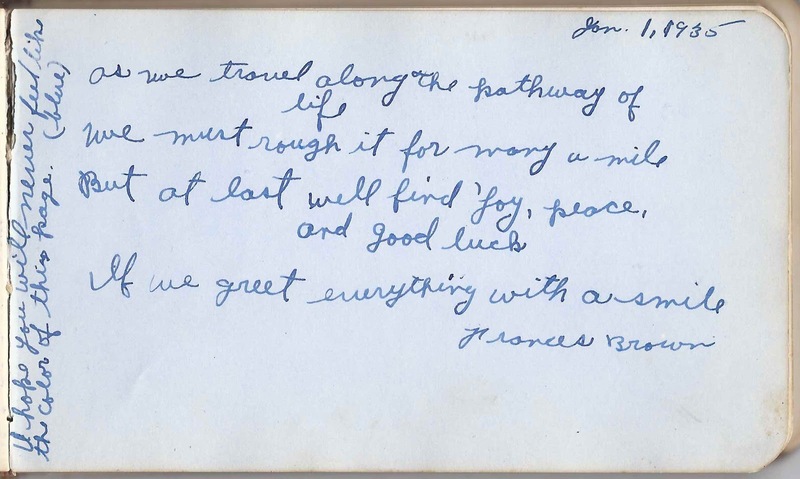 Florence A. Dole, Elizabeth's daughter, signed at North Haven, Maine, on Dec. 26, 1906. Remember me. 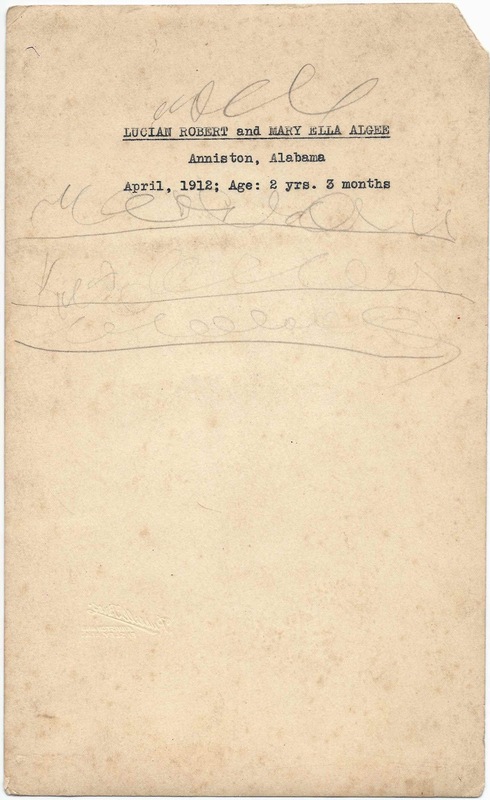 Age 10"
Ruth E. Dole of North Haven, Maine, signed on Feb. 23, 1906. 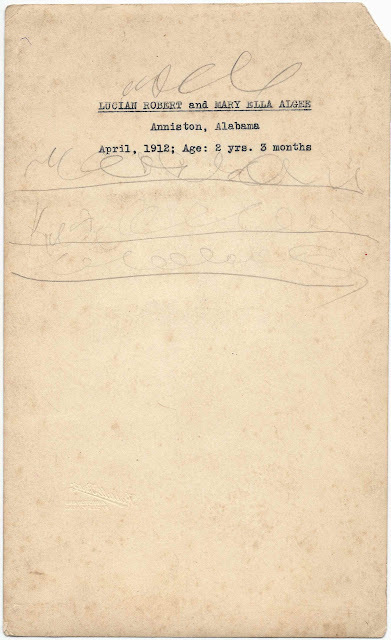 "Age 8"
Asa S. Dole, signed at North Haven, Maine, on March 3th, 1878. Asa was the husband of Elizabeth's sister Leonora and the brother of Elizabeth's husband William Rand Dole. "Friendship has between us past, I trust it has been true And may this friendship ever last Between myself and you." Evalina Dyer, signed at North Haven, Maine, on Sept 1884. Alas, how light a cause may move Dissension between hearts that love; Hearts that the world has tried And sorrow more closely tied. Your friend"
Mrs. Julia F. Grant, signed on July 21st 1878. "To Lizzie, Maiden that readst this simple rhyme Enjoy thy youth - it will not stay; Enjoy the fragrance of the prime For oh! it is not always May! Enjoy the spring of love and youth To some good angel leave the rest; For time will teach thee soon the truth - There are no birds in last year's nest. 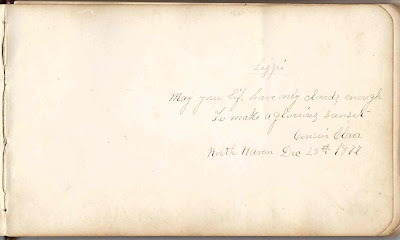 From your friend"
Adelia E. Green, signed at Vinalhaven, Maine, signed on May 3th, 1878. "When you are sitting all alone Thinking of the past, Remember that you have a friend That will forever last. Your Friend." Annie O. Heath, signed on Dec 21st 1883. She mentions both Green's Landing, Maine, and North Haven, Maine. "Little deeds of kindness., Little words of love; Make our earth an Eden Like the Heaven above. Sincerely your friend"
Minnie Kilton, signed at North Haven, Maine, on May 15th, 1887. 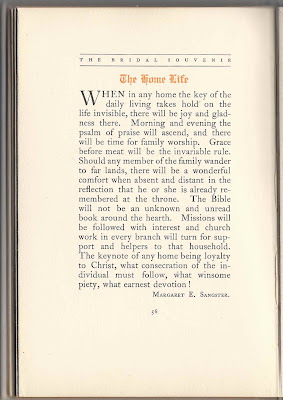 "Safely down life's ebbing tide May our vessels smoothly glide And anchor side by side in heaven. 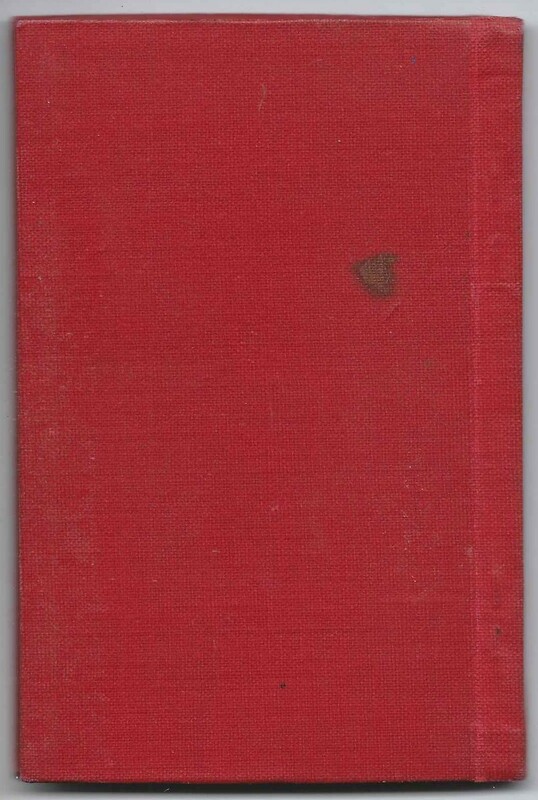 Yours Sincerely"
Mabel L. Knight of East Windham, Maine, signed at North Haven, Maine, on Apr. 23rd, 1893. "May all your days be spent in bliss, May all your plans succeed. Be but as happy as I wish, And you'll be blest indeed." 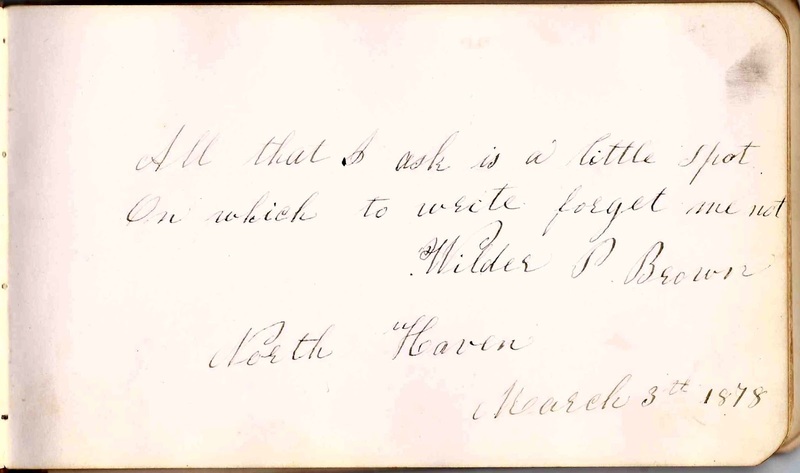 Hannah L. Mills of North Haven, Maine, signed on Feb. 20th 1878. "When friends forsake, and fortune flies, When strong ties break, and friendship dies, When these we loved and cherished here Have proved themselves so insincere, Oh! Then how blessed 'tis to die." F. O. 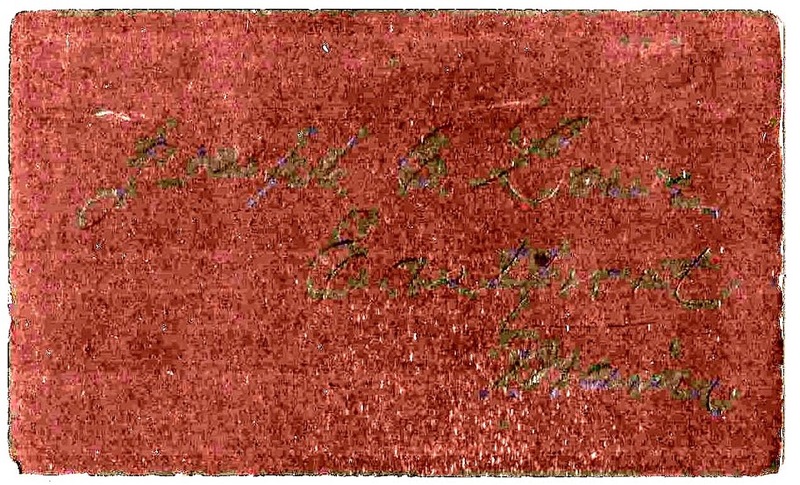 Staples, signed at North Haven, Maine, on March 21, 1878. "Ever your friend"
Corydon S. Staples. He was the Postmaster at Pulpit Harbor, Maine. "Words tell what we should be; Deeds what we are. 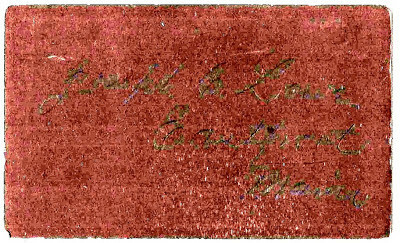 Respectfully, Corydon S. Staples"
Mary E. Staples of North Haven, Maine, signed on April 14, 1878. "A long life and a happy one is the wish of your friend. Remember me." 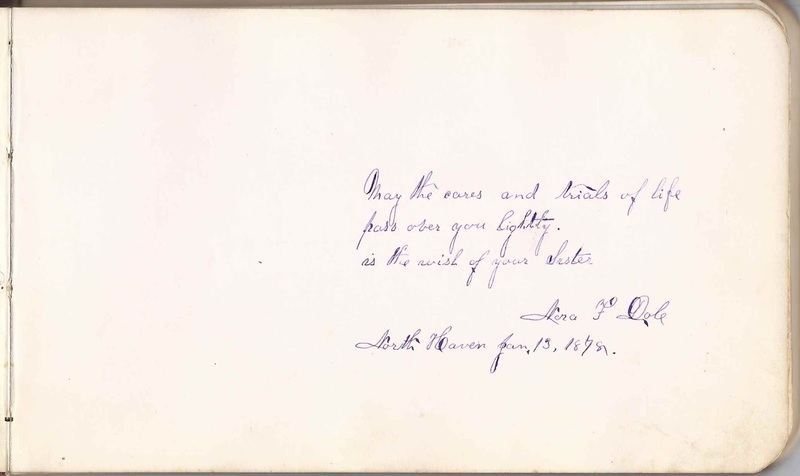 Ella L. Thomas, signed at North Haven, Maine, on May 15th, 1887. "These few lines to you are tendered By a friend, ? and true, Hoping but to be remembered When I'm far away from you. Ever your Friend"
April 1912 photograph of twins Lucien Robert Algee and Mary Ella Algee of Anniston, Alabama. 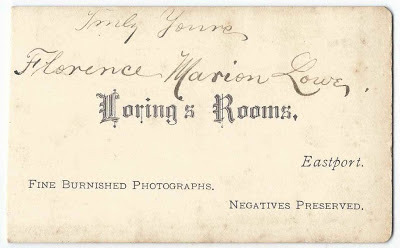 I'm not sure how a Mainer came to acquire this photograph, but it's interesting to note that Mary Ella (Algee) Smith was living at Bangor, Maine, along with her widowed father, when her father died in May 1868. 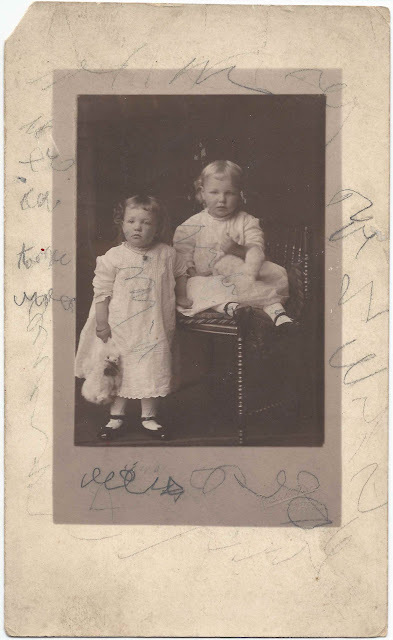 Lucien Robert Algee and Mary Ella Algee were born 3 January 1910 at, I think, Birmingham or Carrollton, Alabama, the children of Robert DeKalb Algee and Louella (Curry) Algee. Lucien married Martha Frances McGeehee in 1939. From a photograph on a family tree online, I learned that he served in the Navy during World War II. I believe he eventually moved to Nashville, Tennessee; he died in 1980. In the 1940 Census of Birmingham, Alabama, Mary Ella Algee was still unmarried, living with her parents and working at an intriguing job as publicity for a concert tour. 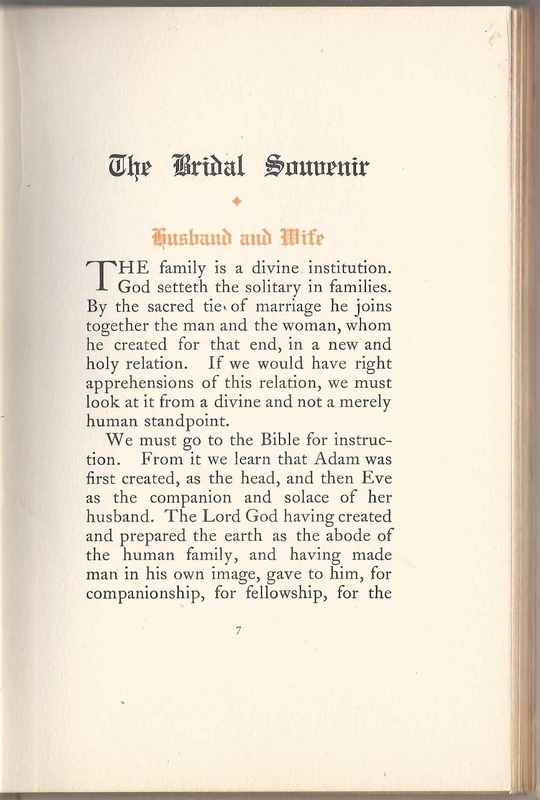 I'm sure there's an interesting story of how she came to meet her future husband, Mr. Smith, and eventually move to Bangor, Maine. If you have corrections to the information above or additional information on the Algee family, please leave a comment or contact me directly. Thanks! CDVs of siblings Joseph Clark Lowe and Florence Marion Lowe, children of John Albert Lowe and Anna Maria (Clark) Lowe. 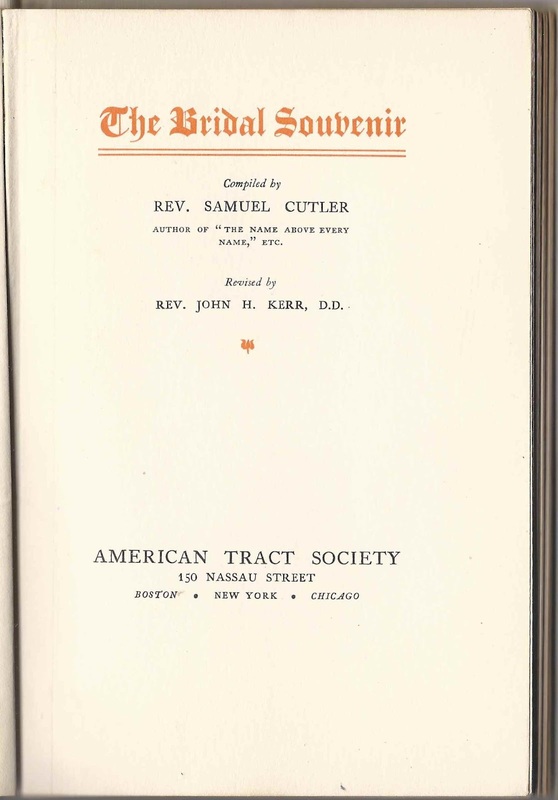 Their father, John Albert Lowe, was the son of Isaiah and Mary Jane (Swett) Lowe. 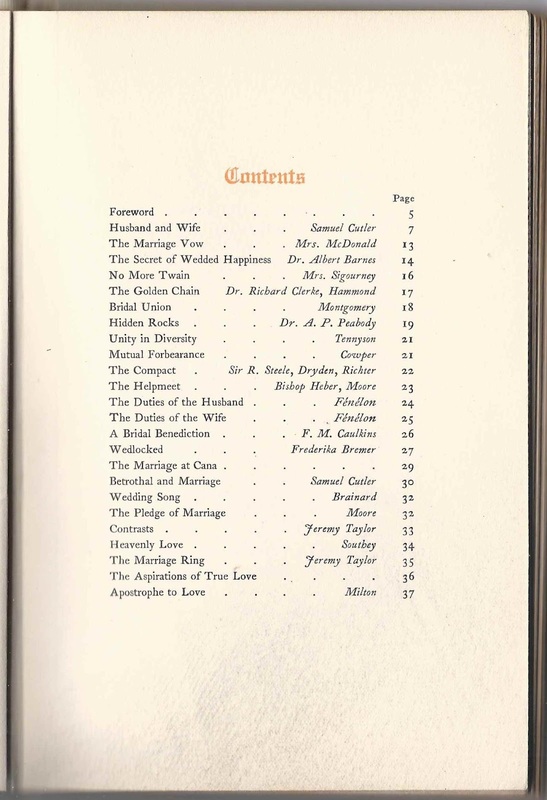 Their mother, Anna Maria (Clark) Lowe, was the daughter of Joseph and Silence (Holmes) Clark. Joseph, born in New Hampshire, was a sea captain. If you have corrections to the information above or additional information to share, please leave a comment or contact me directly. These photographs have been shared with the Maine & Maritime Canada Genealogy network, so if you are related to the Lowe siblings, you might want to check the comments section there. Probationer's Handbook given by Blakey Memorial Methodist Episcopal Church in 1909 to H. Edward Emery. 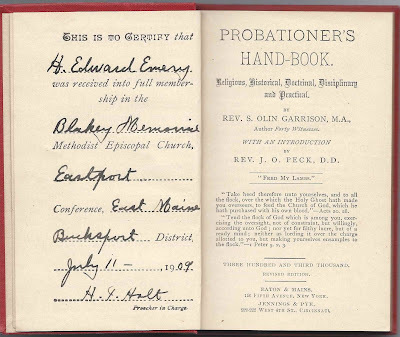 I believe the recipient was Henry Edward Emery, who was born 15 January 1883 at Eastport, Maine, the son of Oliver and Josephine M. (Holmes) Emery. 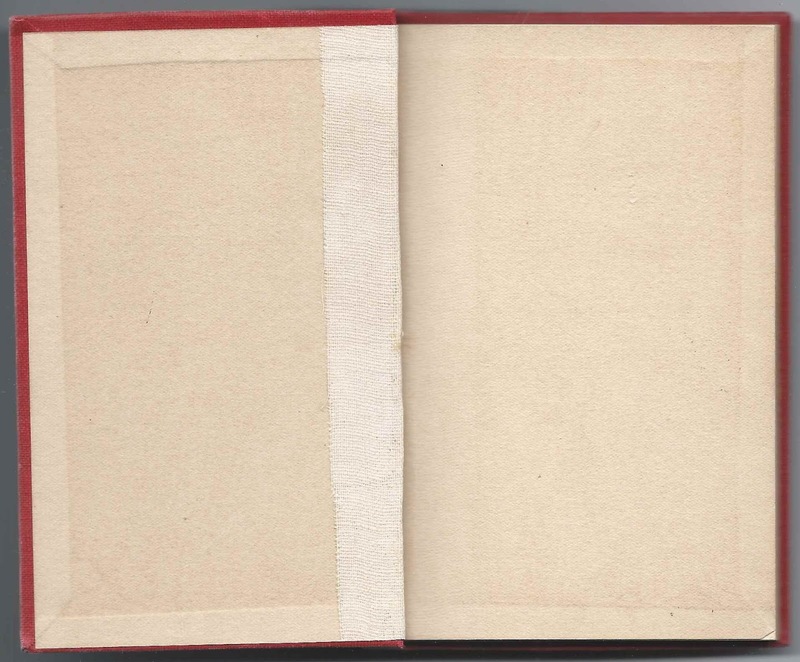 The booklet is approximately 5-1/8" x 3" and contains 96 numbered pages. Henry Edward Emery, who apparently went by the name of Edward, married Lena Emma Dolson, daughter of Ambry and Mary Dolson. 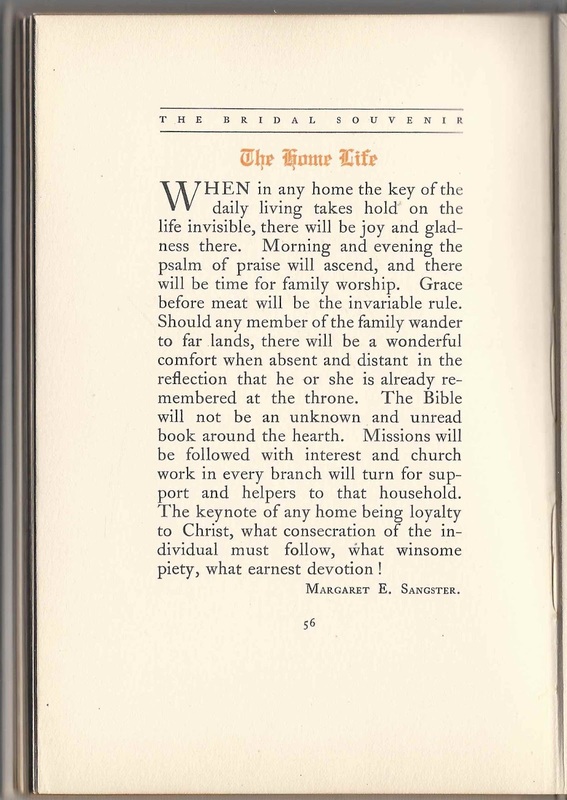 She was born in New York on 20 October 1884. Edward had moved to New York as early as 1910 where he's listed in the Census of Fishkill, already married to Lena, and living in her parents' household. He was working as a bookkeeper. By the time of the 1920 Census, Edward, Lena and their two daughters were living at Beacon, New York, where Edward was working as a clerk. In 1930, the family of four was still at Beacon. No occupation is listed for Edward. By the time of the 1940 Census, Edward and Lena were still at Beacon, New York, where Edward was working as a real estate agent. One of the daughters was out of the household by then. 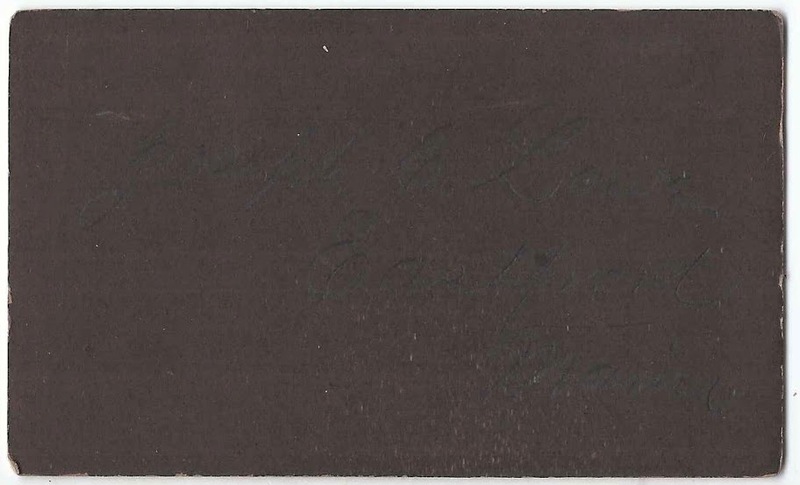 Note made by John Soule, Jr., at Freeport, Maine, on 1 June 1803 promising to pay $12.50 to Ralph Cross. The document was witnessed by Winslow Webb. See another document that includes the name of Ralph Cross here. For Value Received of Ralph Cross, I promise to pay him on his order the Sum of twelve dollars & fifty cents in eight months from date with interest. If you have corrections to the transcript and/or can decipher some of the other writing, please leave a comment. I found more than one instance of a John Soule, Jr., at Freeport, Maine. 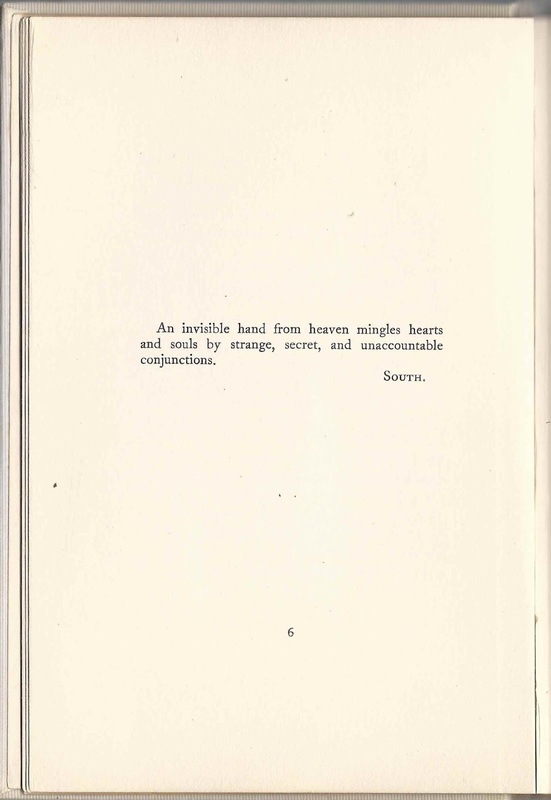 Perhaps John Soule, Jr. was the son, born 13 August 1772, of John Soule, described below in "New England Families, Genealogical and Memorial: A Record of the Achievements of her People in the Making of Commonwealths and the Founding of a Nation", Volume I, by William Richard Cutter, published in 1915. 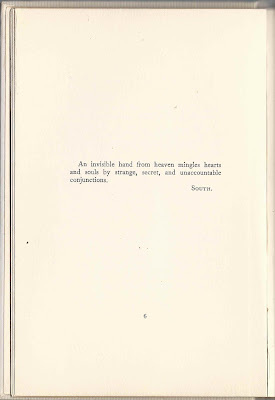 If so, then John Soule Jr.'s mother was Elizabeth (Mitchell) Soule, daughter of Benjamin and Mehitable (Bragdon) Soule. A hitch with this theory is that most online references have this John Soule, Jr., as having died in 1800, whether in error or not. If you have corroboration that this is the likely John Soule, Jr., or feel that the note maker was a different John Soule, Jr., please leave a comment or contact me directly. Thanks! Ralph Cross was born about 1764 and was a merchant at Portland, Maine, with a store at Freeport, Maine. He died 15 October 1815 at Portland, Maine. 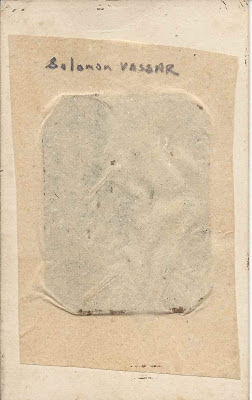 It's possible that the note's witness, Winslow Webb, was the son of John and Priscilla (Winslow) Webb, born 4 June 1778 at Hardwick, Massachusetts. He was living at Freeport, Maine, during the relevant time frame, though he and his family later moved to Turner, Maine. That Winslow married Betsy Means/Meins at Freeport, Maine, on 10 January 1805; they had, I believe, twelve children. If you have corrections to the information above, or additional information on John Soule, Jr., Ralph Cross and/or Winslow Webb, please leave a comment or contact me directly. Thanks for stopping by! Note given by Simeon Sanborn of Standish, Maine, on 28 March 1801, to John Deane, also of Standish, Maine, in the amount of $11.60. 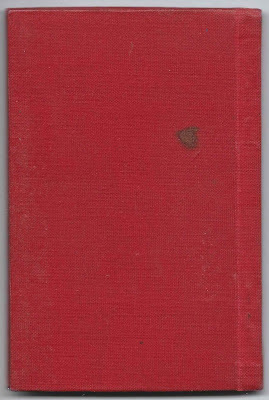 For value received I promise to pay to John Deane on order the sum of Eleven Dollars and Sixty Cents in Sixty Days from the above date. Witness my hand. With interest with the same until paid. Simeon Sanborn, assuming I have the right person, was born 5 July 1759 in New Hampshire, son of Daniel and Jane (Moulton) Sanborn, Hampton, New Hampshire natives. Early in Simeon's life, in 1763, Daniel moved his family moved to Standish, Maine, following the original settler, Ebenezer Shaw. On 9 January 1782 at Standish, Simeon married Hannah Ward, whose parents, according to a record at Bethel, Maine - see the comments section - were Nathan and Mary (Tret/Treat) Ward. It's worth noting that many online trees and histories give her parents as Joseph Ward and Mary (Treat) Ward, natives of Barnstable County, Massachusetts, who moved to Maine. None of the trees list a source, however. I believe Simeon and Hannah had nine children: Stephen; Mary; Joseph Coleman; John; Hannah; David; Lettice; Lucy; and Esther. Simeon was the town clerk at Standish for many years, before moving to Greenwood, Maine, and, finally, Bethel, Maine. I don't know if Simeon himself precipated the moves and drew some members of his family with him, or if he was moving to where one or more of his children had already moved. He died at Bethel on 28 October 1832. John Deane was born 11 June 1743 at Dedham, Massachusetts, son of Samuel and Rachel (Dwight) Deane. On 16 September 1766, at Norton, Massachusetts, John married Miriam Hodges, daughter of Joseph and Miriam Hodges. 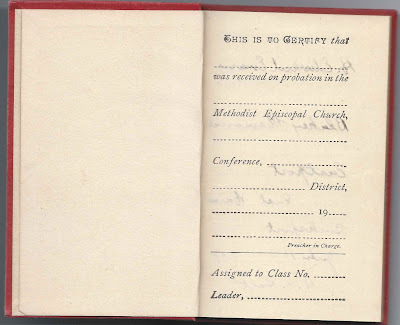 By 1786, John Deane had moved to Standish, Maine, where he was elected moderator at the first election there after the town's incorporation in 1785, and where he performed the first marriage at Standish, between Sargent Shaw and Annie Tompson, on 14 September 1786. 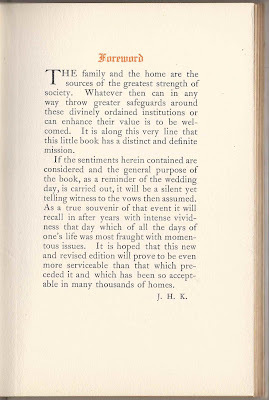 They had at least one child, a daughter Miriam, born 6 January 1878. She married Enoch Freeman Higgins. 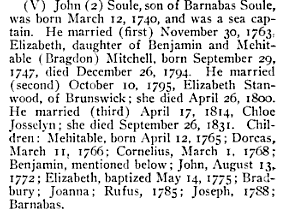 John's wife Miriam died in 1791, so it's possible that he was the John Deane of Standish, Maine, who married Mary Jewett at Newburyport, Massachusetts on 20 June 1793. John Deane served as Justice of the Peace for Cumberland County, Maine. He died at Standish, Maine on 6 May 1826. I found information on Sheriff David Learned here on Find-a-Grave, but the listing itself was apparently for his son. 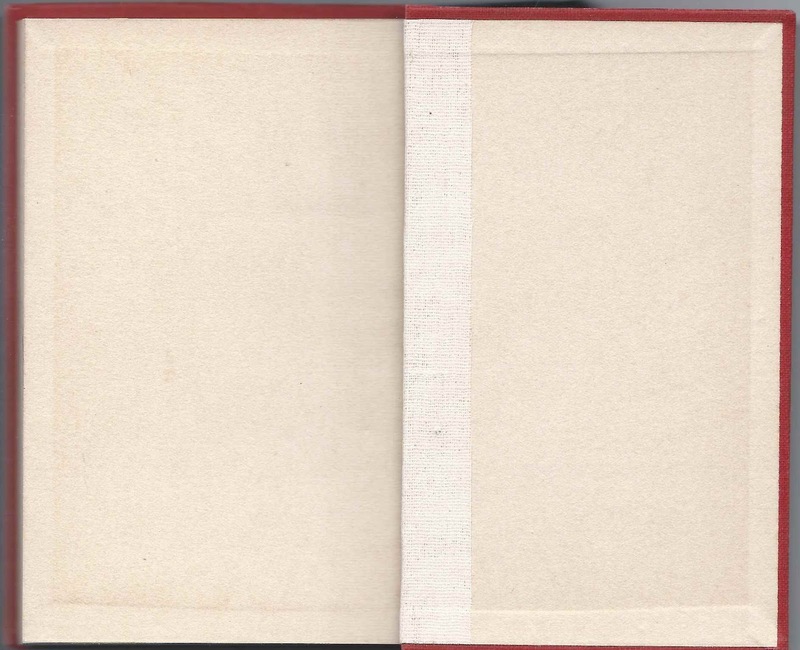 If you can fill in the blanks in the transcription or if you have corrections to the information above, or additional information on the Sanborn, Deane and Learned families, please leave a comment or contact me directly. Thanks! 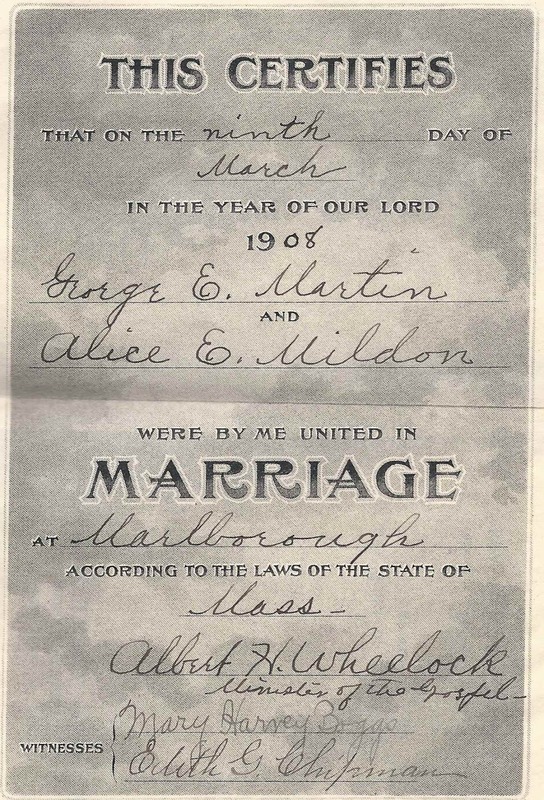 Wedding book from the wedding of George Elwin Martin and Alice Estelle Mildon at Marlborough, Massachusetts, on 9 March 1908. More about them, below. Witnesses were Mary Harvey Boggs and Edith G. Chipman. The minister who performed the ceremony, Rev. 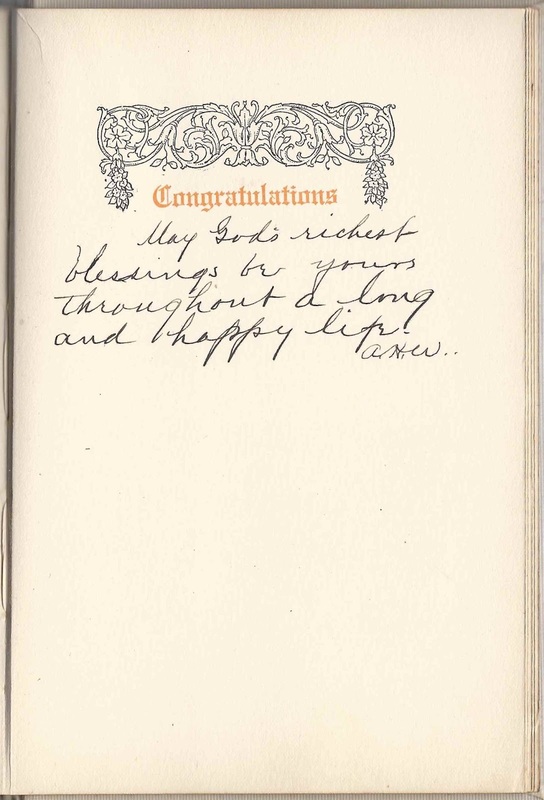 Albert H. Wheelock, left the only message in the Congratulations section. 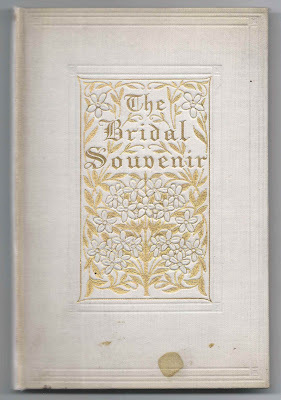 "The Bridal Souvenir" was published by the American Tract Society in Boston, New York and Chicago and was compiled by Rev. 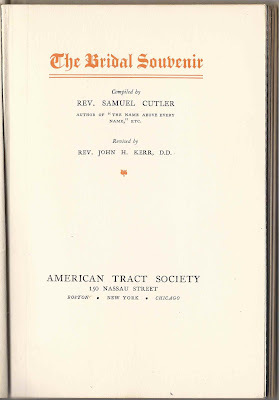 Samuel Cutler and Revised by Rev. John H. Kerr, D.D. 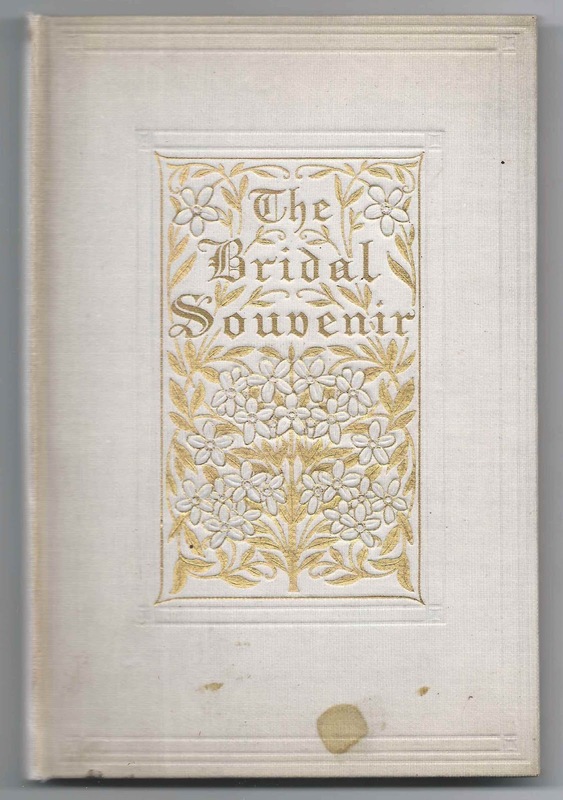 It measures approximately 7" x 4-3/4" and contains 56 numbered pages, plus others. 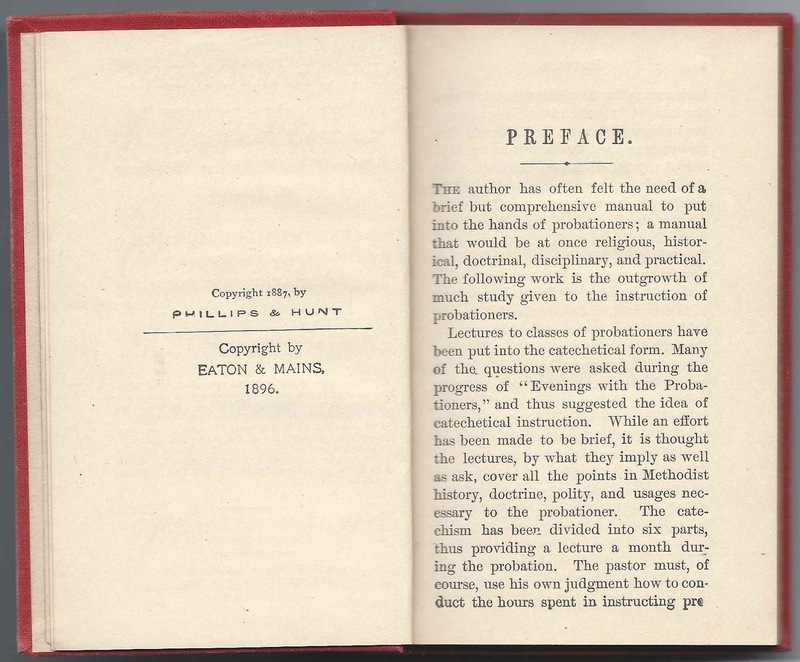 The original copyright was 1876; the latest copyright shown is 1906. 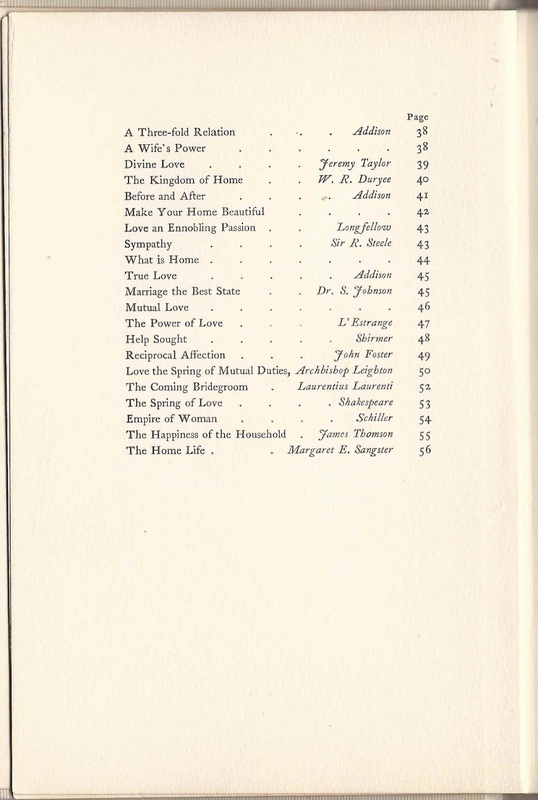 The forward was written by John H. Kerr, D.D. George Elwin Martin was born 13 December 1881 at Jaffrey, New Hampshire, the son of Byron E. Martin and Mary Lizzie (Bass) Martin, who were born at Manchester, New Hampshire, and Sharon, New Hampshire, respectively. 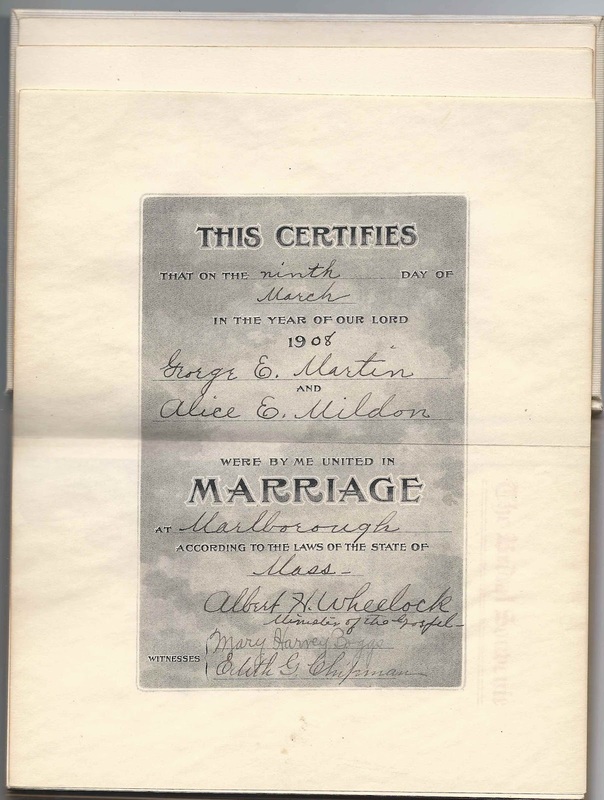 Alice Estelle Mildon was born at Eastport, Maine, about September 1882, the daughter of Frederick Robert Sayles Mildon and Abigail Churchill (Travis) Mildon of Nova Scotia. Frederick was a mayor of Eastport, Maine before moving to Marlborough, Massachusetts. Frederick's younger brother, William Shaw Mildon, also born at Weymouth, Nova Scotia, was a successful merchant and civic leader at Eastport, Maine. William's wife, Sabina (Travis) Mildon, was a sister to Frederick's wife, Abigail Churchill (Travis) Mildon. 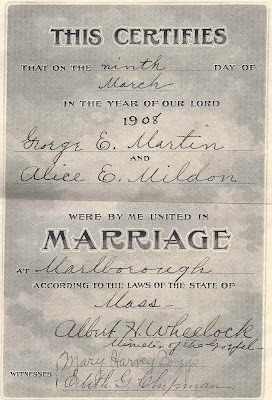 George and Alice lived at Marlborough, Massachusetts, where George was superintendent of the Springhill Cemetery, according to his 1942 World War II Draft Registration Card. They had at least one child, a daughter. Outer covering approximately 13" x 3-1/4", with a thinner ply inner sheet slightly smaller, folded once. Bounded with a lilac colored cord. 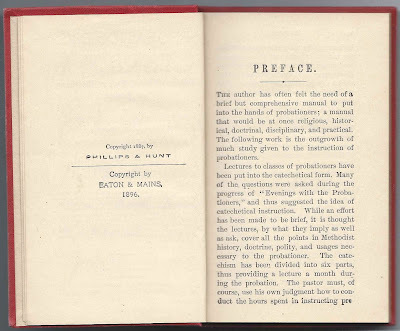 Printed by the Franklin Journal Print, at Farmington, Maine. 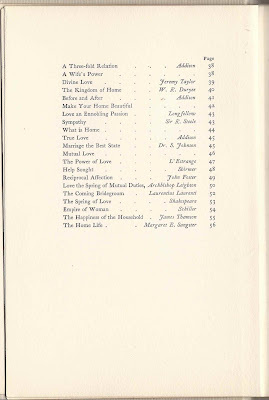 Salutatory, Harry Sanborn Thomas, "Turkey and the Nations"
Essay, Edith A. Luce, "The Development of the English Drama"
Declamation, John Glenwood Winter, "The Chariot Race"
Semi-Chorus, "The Bells of Seville"
Song, Dorothy McKeen, "Madame Butterfly"
Valedictory, Golda G. Gushee, "The City of My Dreams"
If you have information to share on any of the people mentioned above, please leave a comment. Thanks!